The Board of Mesa County Commissioners along with Garfield, Moffat and Rio Blanco Commissioners attended a press conference held at Colorado Mesa University regarding Anvil Points hosted by Senator Cory Gardner, Congressman Scott Tipton and Department of Interior Deputy Secretary David Bernhardt Friday, April 6. Senator Cory Gardner discusses the importance of returning oil and gas lease revenues rightfully owed to rural Western Slope communities from which these funds were taken. Deputy Secretary David Bernhardt discusses Anvil Points with western Colorado community leaders via video conference from the White House. Senator Cory Gardner, Congressman Scott Tipton and Department of Interior Deputy Secretary David Bernhardt host a Western Issues Roundtable discussion to hear from local elected officials and leaders. Mesa County Commissioner Scott McInnis discusses matters important to Mesa County at the Western Issues Roundtable discussion. Mesa County Commissioners Scott McInnis and John Justman catch up with Garfield County Commissioner John Martin. Garfield County Commissioner Mike Samson, Mesa County Commissioner Rose Pugliese and Moffat County Commissioner Ray Beck pause for a picture at the Anvil Points press conference. 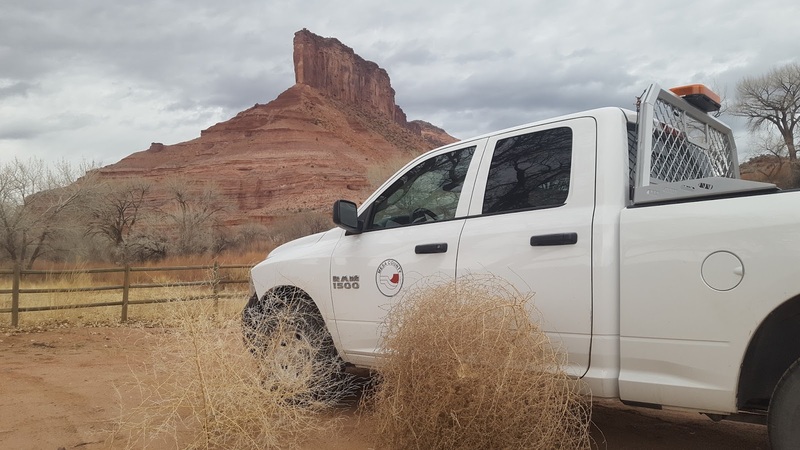 Mesa County Commissioner John Justman talks about grazing rights and permits on Bureau of Land Management (BLM) land in western Colorado. Mesa County Commissioners Rose Pugliese and Scott McInnis at Colorado Mesa Univerity. The Board of Mesa County Commissioners adopted a proclamation at their April 2, 2018, administrative public hearing recognizing April as Child Abuse Prevention Month, encouraging those who suspect child abuse and neglect to report it immediately. The Mesa County hotline for reporting child abuse and neglect is 970-242-1211. Calls to the alternative statewide hotline, 1-844-CO-4-KIDS (1-844-264-5437) will be routed to Mesa County child protection professionals. Both phone numbers will reach someone who can help 24 hours a day, seven days a week. Everyone in our community can play a role in the prevention of child abuse and neglect. Mesa County Child Welfare Division Director Kari Daggett accepted the proclamation and stated the following: “Preventing child abuse and neglect is a community effort. Every citizen in Mesa County can play a part in prevention efforts whether it be getting to know the children in your neighborhood, encouraging a struggling parent you see in the store, volunteering your time as a mentor, or becoming a foster parent. 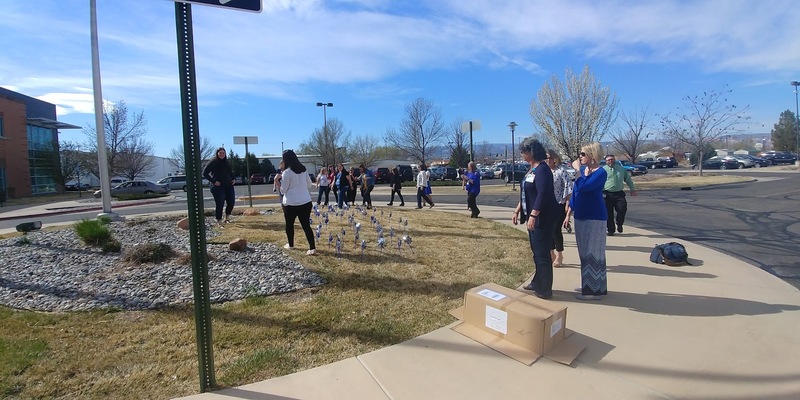 Child Abuse Prevention Month is an opportunity for us to recognize that we all play a role in child safety.” To learn more about child abuse prevention, visit Mesa County’s Child Protective Services page. Here you will find information that will help you understand the information needed by child protection professionals when reporting suspected child abuse and neglect. The Partnership for Children and Families along with other local organizations in conjunction with the National Association for the Education of Young Children, are celebrating April as the Month of the Young Child. The Month of the Young Child is an opportunity to celebrate young children and the caregivers who lay the foundation for their future success. It’s a time to turn our attention to the many people, places and programs that support the healthy development of our children. The Mesa County Commissioners recognize the Harmony Acres Equestrian Center in public hearing. Harmony Acres offers a sanctuary and healing space for animals and people. For more information, visit https://goo.gl/fGtggW. Mesa County Animal Services Manager Doug Frye with a Macaw (a king-sized member of the parrot family) on his shoulder. The bird was surrendered to Animal Services. 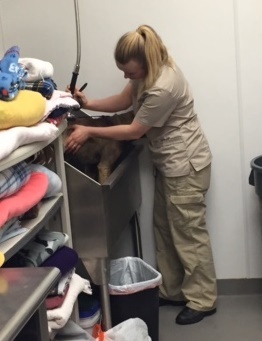 Animal Services Officer Rebecca Dillon gives a dog a bath. Workforce staff pulled an April Fools' prank on Hilltop Director Hollie VanRoosendaal (front, center with pink shirt) by wearing vets. VanRoosendaal usually wears a vest, but not that day! Mesa County Clerk and Recorder Sheila Reiner wraps up Peak Academy training with the Elections team. 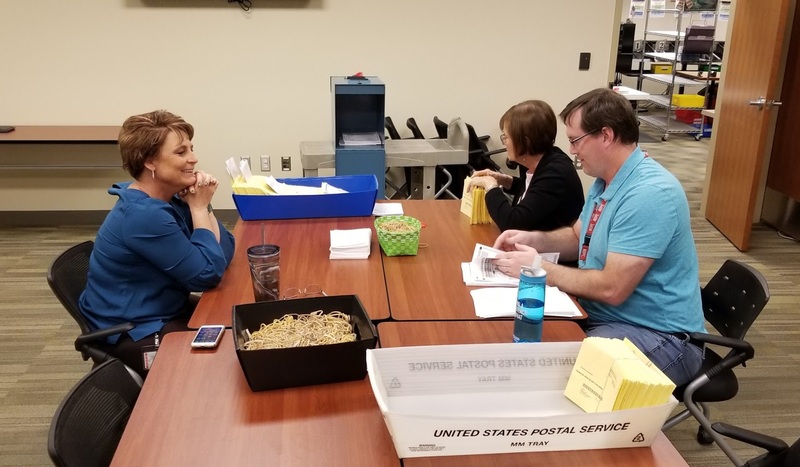 Elections Director Amanda Polson participates in the final class led by Mesa County Clerk and Recorder Sheila Reiner, regarding the five principles of innovation from the Denver Peak Academy. Mesa County Clerk and Recorder Sheila Reiner lead the last class of an in-house training with the Elections team where she shared techniques and exercises that she learned from the PEAK Academy in Denver. Elections Coordinator Jesse Redmond and Elections Director Amanda Polson get ready for Municipal Election Night. Fruita Clerk's office staff and DeBeque Clerk's office staff work together during election night. City of Fruita staff participates on election night. Elections Coordinator Jesse Redmond adjudicating. 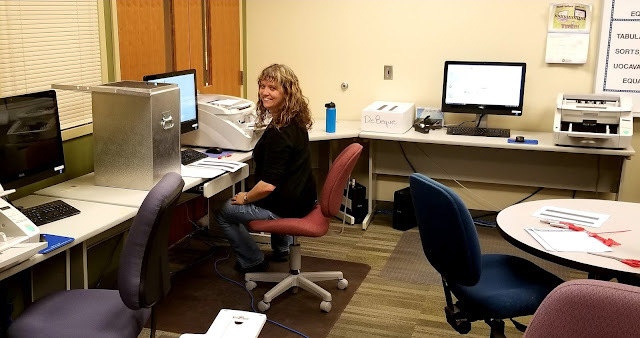 Elections Technician Karen Reiher pauses for a picture while tabulating. 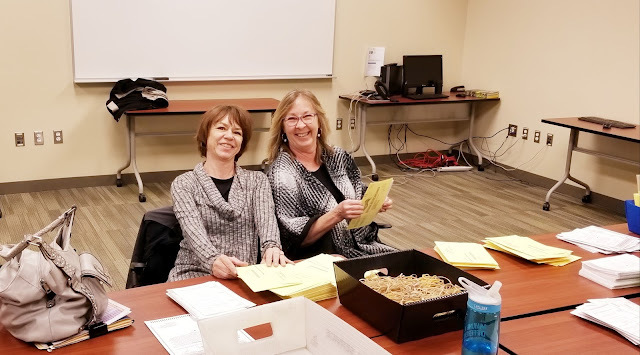 Mesa County Clerk and Recorder Sheila Reiner joins staff members on the Municipal Election night. 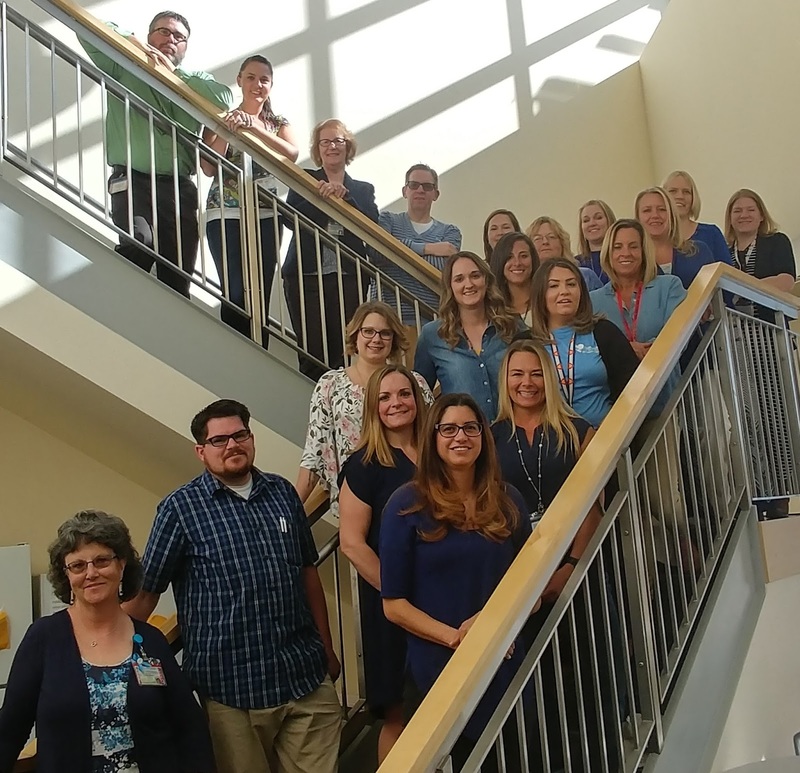 DHS Child Welfare staff dressed in blue in honor of National Child Abuse Prevention Month. Child Welfare staff planting pinwheel gardens for National Child Abuse Prevention Month. 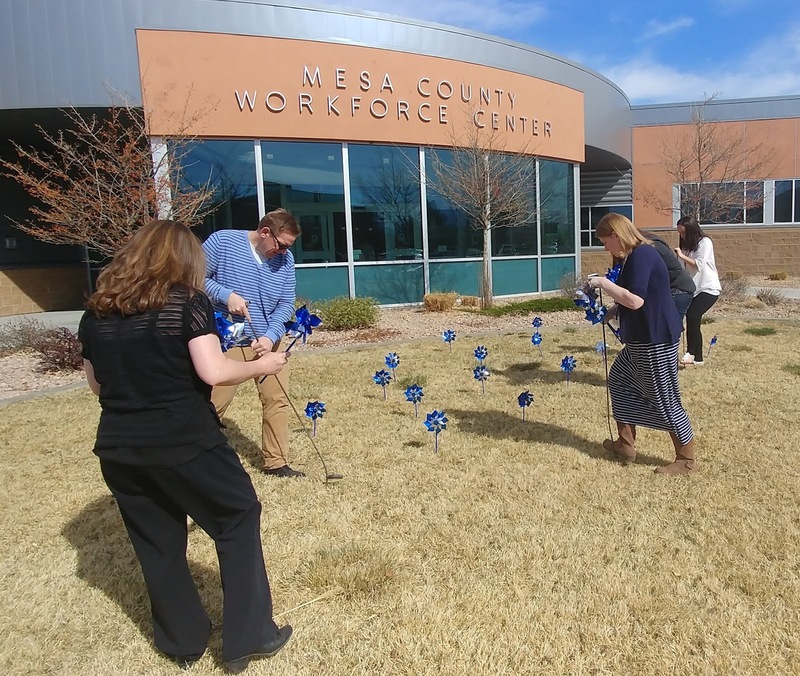 Staff planting pinwheels in front of the Mesa County Workforce Center. Jacque Berry, Child Welfare Hotline Supervisor, being interviewed by KJCT regarding the Child Abuse & Neglect Hotline. 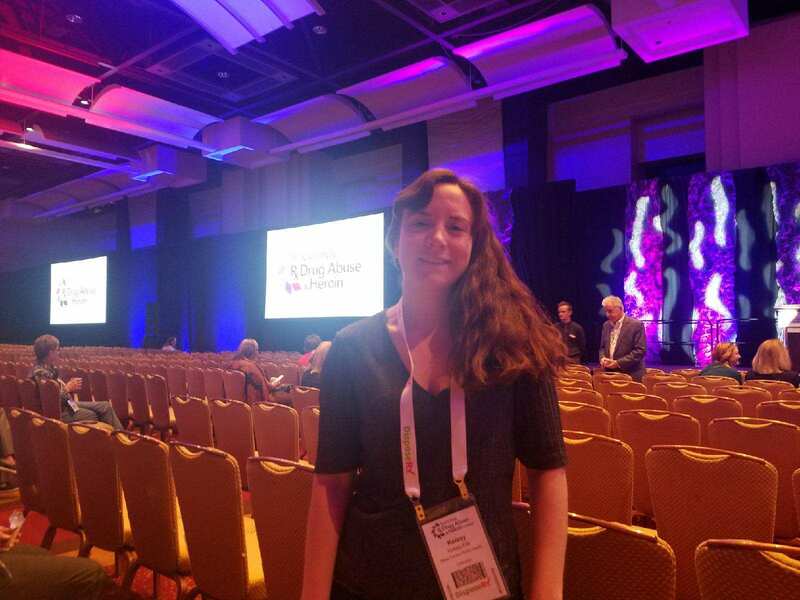 MCPH Health Promotion Specialist Kelsey Fife attended the 7th Annual National RX Abuse and Heroin Summit in Atlanta, GA, this week. She learned more about the opioid crisis and the different approaches to solving it as she works on a prescription opioid overdose prevention grant from the Colorado Department of Public Health and Environment. 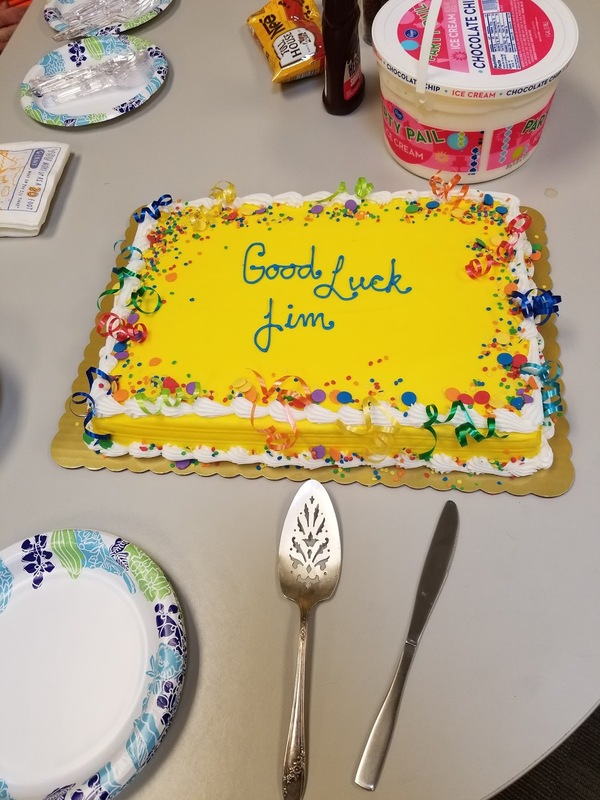 Mesa County Public Works hosted a farewell celebration for Jim Nall, divisional director for engineering and traffic. 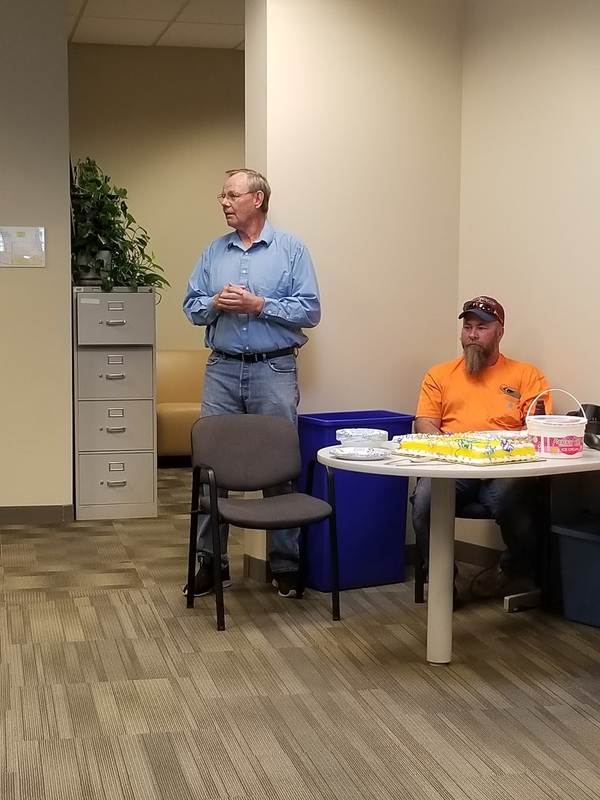 Jim Nall is recognized by Public Works staff for his hard work and dedication during his tenure. Good luck in all your future endeavors, Jim Nall! 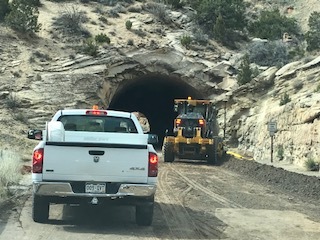 Construction continues on schedule on the east hill of the Colorado National Monument. Do you feel like you're driftin' along with the tumblin' tumbleweeds? 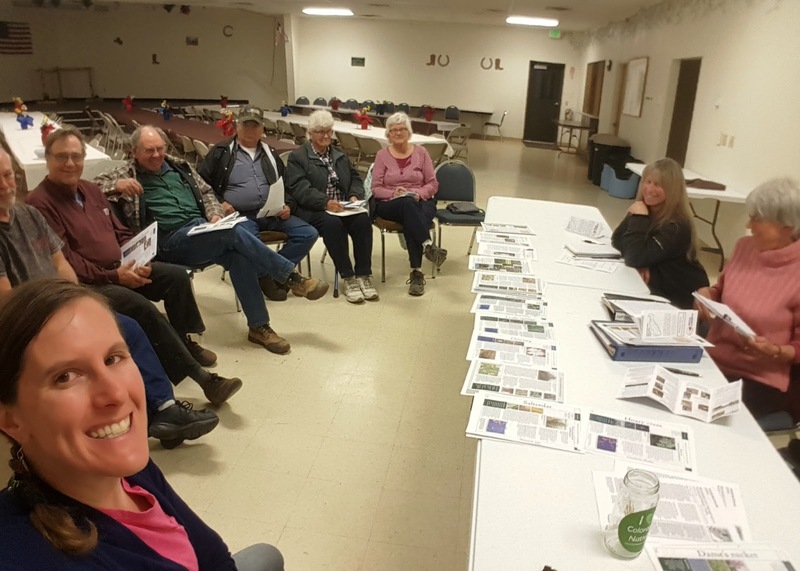 Get a head start on your problem weeds by finding identification and management tips from Mesa County Noxious Weed and Pest Management at www.mesacounty.us/pest or CSU Extension http://tra.extension.colostate.edu. Teresa Nees with Noxious Weed and Pest Management visited with Gateway property owners about noxious weed problems in the area and projects happening in Unaweep Canyon and along the Dolores River. 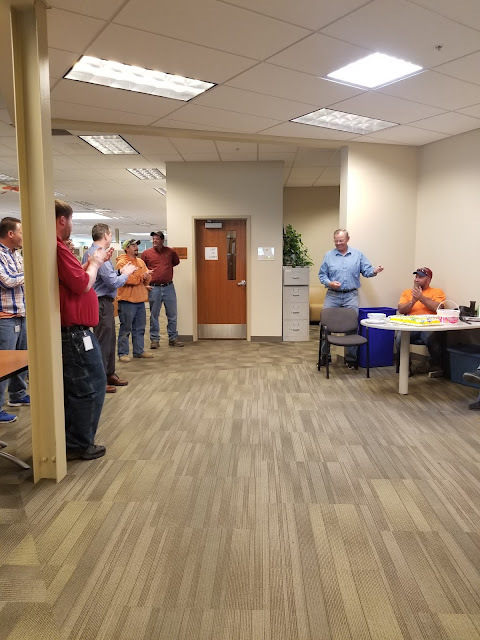 Construction continues at the Mesa County Building and Planning departments. 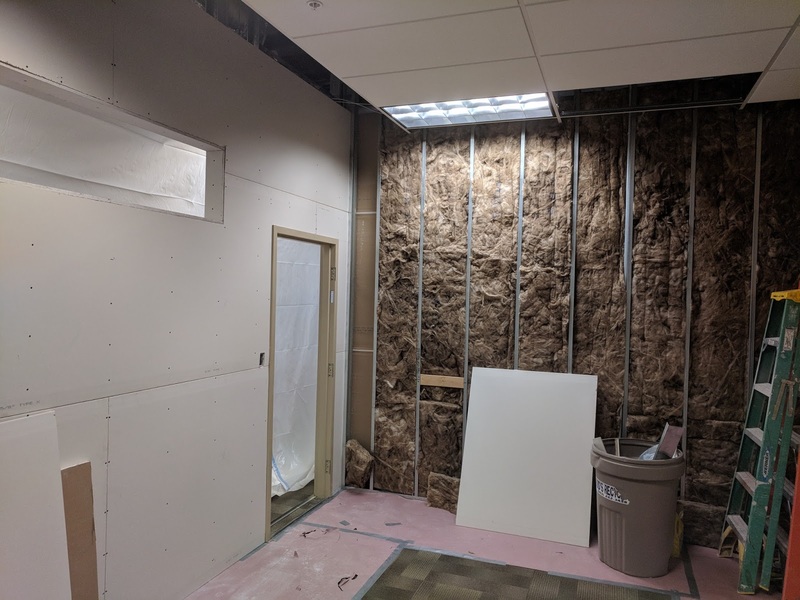 A new enclosed conference room is being built. 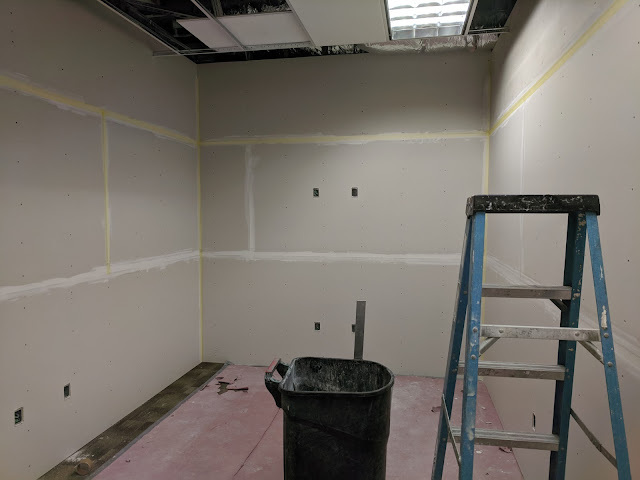 The new conference room is coming together nicely at the Mesa County Central Services Building. Springtime looks good at the Mesa County Fairgrounds!